First, the Magic Molder is the safest design I’ve seen for a table saw molder system. The head has two, approximate 1-3/4” circular openings 180 degrees apart, the bottoms being about 1-3/16” below the outer circumference of the head so that the plug’s diameter is well below the surface. This encloses and surrounds the plug so it can’t be thrown out from the head. The round cutter plugs come in some 83 different profiles. These cutter plugs are locked into the head by first sliding the plug into the head and then twisting the plug to lock it in place. (This locking groove can be seen in the second photograph above.) The plug is then set in the locked position by tightening the setscrew that is on the opposite side of the locking groove. (See the third photograph above.) The old system I have, like all the other molding head systems that I’m familiar, has flat profile blades that are locked into a slot on the head. Also, the old molding head appears to have been made out of a pot metal that always seemed to flex when the locking, hex screw was tightened. The Magic Molder head has no flex and locks solid. Second, the Magic Molder head is machined from top quality aluminum and the cutter plugs are machined from steel. The quality and precision is obvious from the photographs and a physical examination only confirms the beauty of these machined parts. The balance is perfect, creating a sweet hum when the saw is turned on. As noted the head has no flex when the plugs are tightened and the treads are cut in aluminum so there is no concern that such threads will strip when tightened. These 7” diameter heads are available with 5/8”, 3/4” or 1” bores. The plugs are electronically balanced to make them vibration free. Fifteen years ago, I built a Norm Abrams Delft Rack in Mahoney to match a buffet I inherited from my great aunt. This project presented great challenges for cutting molding to complete the requisite trim. I’m working on a rebuild of this Delft Rack in white oak as a gift for family and friends. I’m thinking that I’ll blog my experiences using this Magic Molder system to cut these moldings just for the fun of blogging and using my new Magic Molder head and plugs. Those look really nicely made. However, at $150 for the molding head + $140 per profile, that thing would get ridiculously expensive in a short amount of time. The standard 2” crown molding profile is almost $280! I love that the guys blood is present on the table saw fence. This looks very great. A nice system. But the diameter of the tool is to small for the spindle speed of most circular saws and for that reason not aloud in europa. The minumum speed in europa has to be 40 M/sec (114 KM, 90 Miles per hour) when the wood feeding is done by hand. The reason for this is that the anti kickback system will get functioning worser. Also a none kickback system on molders and so on are not aloud. That looks like a sweet outfit! Good to hear about product that work!! I like that locating dowel on the back side of the cutter. 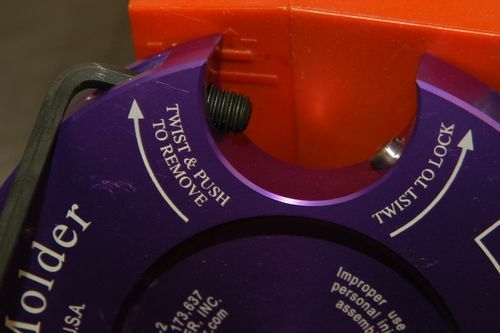 It insures alignment and that the cutter can’t fly out if the screw is loose. I have an old Sears one that I never use since I have a router table but I made 10 sets of HSS cutters for it and only used one set once! I have looked at this moulding head several times and it looks like a great tool but up here in Canada there seems to be no source so next time I make a trip down I may just take a look and in the mean time the Craftsman set that I have will have to do . Thanks for looking and thanks for your comments guys. Yes, as I said, the system is not inexpensive, but it is top quality. And, no that is not my blood in the picture if you’re referring to me as “the guy”, Alan—just a red formica top for my ZCI in the first picture and matching red, Bessey clamp heads to prop up the molder head for the other pictures. As for the speed, I would only submit the last photograph of the great cuts I got in highly figured white oak—cuts with absolutely no tear out! There was no hint of kick back, but I did use a system of feather boards on both the side and the top. Looks like a pretty descent system. I’ll keep this in mind. I can see why you would get quality cuts. Good find. this looks like a great addition to your armoury. Good job on the Oak mouldings, nice smooth cut with no tear-out. Had a look at the video and the fence looks like a good addition. But I am sure if you don’t already have one, a shop-built fence is in the offing. Some kind of Zero-Clearance insert would also be beneficial. Can you use it on a SawStop? You need an 8” Dado blade for the SawStop. I highly doubt there’d be a way to do it safely I’m afraid. I was thinking the same thing though as I read this. The diameter looks far to small for the 8” Dado cartridge to work. You may be able to “trick it” I guess by just having the standard cartridge installed? But you’d lose the safety features. that said, I am interested in this! I have always loved the “idea” of molding heads on the Tablesaw, but they have not seemed ready for prime time. In use they have been difficult and a little scary. This one seems to have finished the recipe quite well! Another thanks to everyone for checking this out. If you don’t run out and get one now, it is something to keep in mind should a need ever arise. 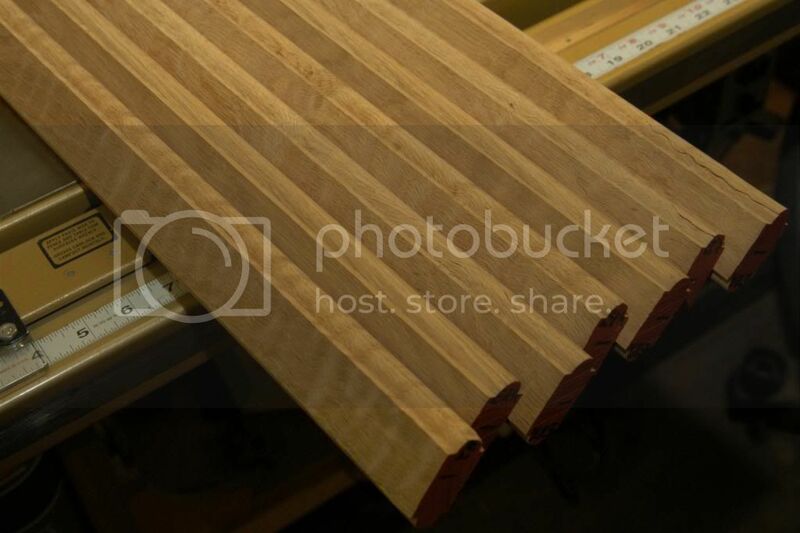 Jinky (James)—Yes, I have a special fence I build back in the mid 90s that is prefer and use for this and router table use and any time I want to use vertical feather boards. I’ll try to start my blog with a post on my fence system and a special feather board jig I also built at the same time. The dull red object immediately behind the Magic Molder in the first picture is a ZCI for that particular plug profile. You can see another ZCI plug profile here: http://lumberjocks.com/projects/102168 I have ZCI for each plug profile I’m using and find they really help in setting up the cut, left to right from the fence. Domer—I just got off the phone with Jack Ballew and he confirms that you can NOT use Magic Molder with SawStop. But, Jack assures me that SawStop is the future; however, I’m sticking with my old PM66 for sentimental reasons, the quality and the fact I love it. Klauss—I asked Jack to check on Magic Molder in Canada and he provided me with this link: http://mywoodcutters.com/ Hope this helps and also helps other LJs in Canada. Hmm, so someday maybe for SawStop. In the meantime, we could dust off that old Unisaw and put it back to work. thanks for the review and all the info!